I do not know about you but I am always curious about how an artist feels about his own career. Was he happy with what he has accomplished or disappointed that he did not received deserved recognition? Even when an artist does not discuss these issues directly what he has to say is often revealing of his self evaluation. Unfortunately Mort Meskin never gave an interview and so we will probably never get a good understanding how he viewed his own work*. But if we cannot answer the more interesting question can we at least answer a lesser one; did Mort Meskin know that he had ever created a successful feature or title? 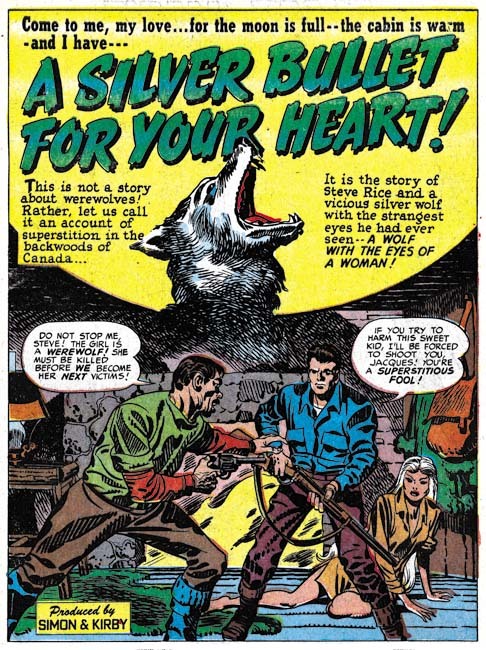 With a blog about Simon and Kirby it is easy to forget that while Joe and Jack had a number of successful creations most comic book artists, no matter how talented, never did. But was there any feature created by Mort that he would have known as a success? But how do we, or did Meskin for that matter, judge what was a success? Certainly creating a feature with its own long running comic book would be a sure sign of success. While Meskin did create Golden Lad it only ran for five issues so it was hardly a big success. 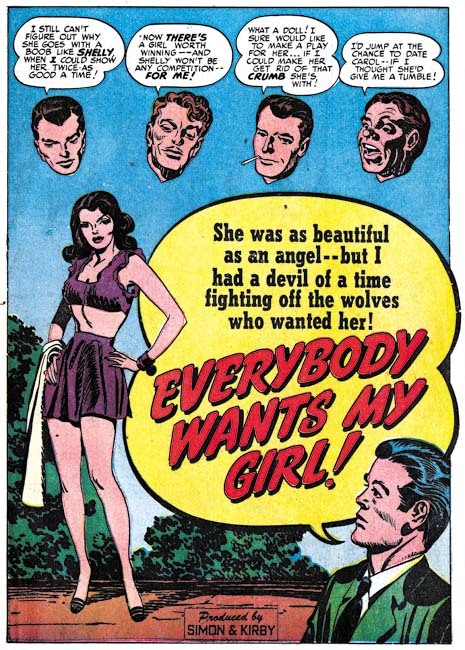 Another sign of a successful feature is for it to appear on the cover of the comic. 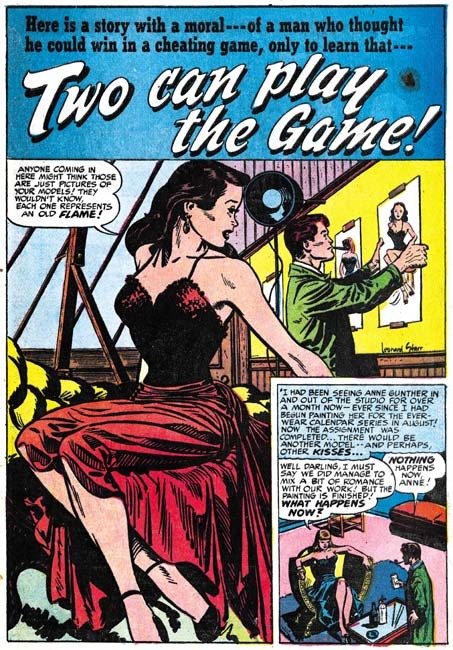 By that criterion Meskin’s Johnny Quick was a success because it appeared on the cover of More Fun Comics. However Johnny Quick only appeared on the cover a couple of times and the cover honors much more frequently went to the Green Arrow. Actually I am not a big fan of Johnny Quick, but that is my personal opinion and hardly the criteria to be used in determining if a feature like Johnny Quick was successful. Still if Johnny Quick had a limited success how about the Vigilante (of which I am a big fan)? Well no matter how popular the Vigilante was it would hardly be expected to push Superman off the cover of Action Comics. So without its own comic book and never having appeared on the cover of Action, must we admit that the Vigilante was not a success? Well I for one am not willing to accede that the Vigilante was a failure. 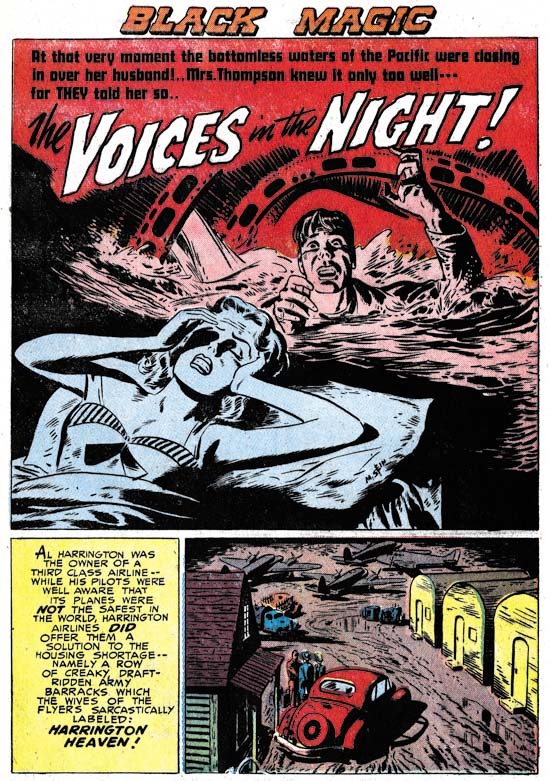 How could I with all the great splashes that Mort Meskin created for the character. 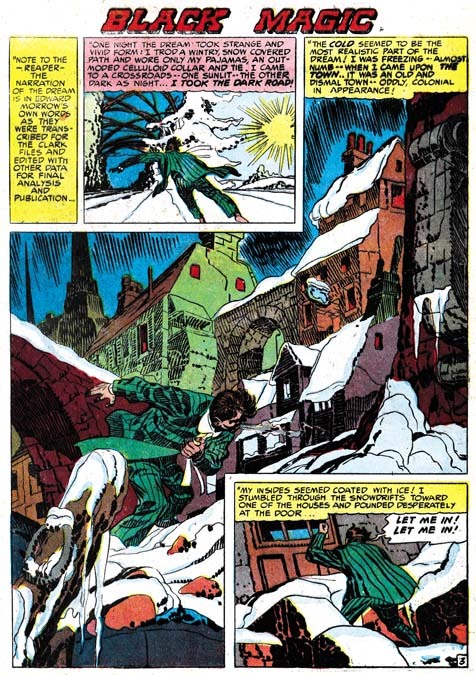 During the time Meskin worked for Simon and Kirby he rarely provided full page splashes and nothing, full page or otherwise, like the splashes for the Vigilante. They are just marvelous. I have previously shown some but I would like to present some more here. 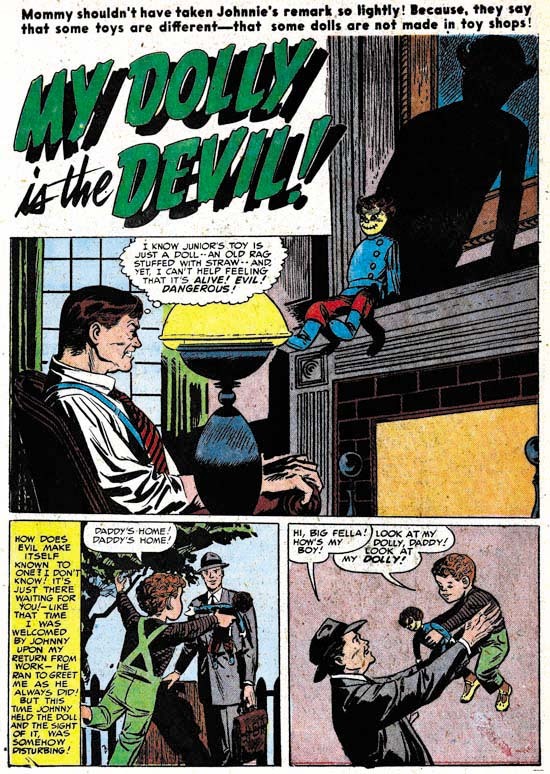 The Vigilante allowed Meskin to more frequently portray action then he would get working for Simon and Kirby or afterwards when he returned to DC. But not all Vigilante splashes can truly be said to be action scenes. Certainly the one in “Crimes in Color” cannot be called action but look how at the dramatic tension Meskin has provided. The Vigilante has been captured by the light which also provides a shadow cast by his opponent. While the Vigilante seems ready to spring into action he seems uncertain from which direction the threat will come from. 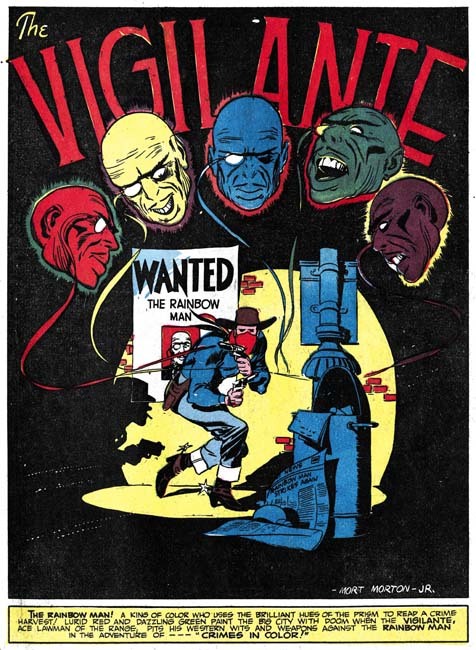 His true opponent, the Rainbow Man, is presented above as a series of floating heads that show their glee at the Vigilante’s predicament. “The Bard of Banditry” is one of my favorite Meskin splashes. It is true that there is no action or drama, and even the Vigilante is absent! Somehow the Vigilante hanging in effigy and the laughing Bard are sufficient to make this splash work. Meskin often used oversized figures in his splashes. I suppose this was done to suggest that the Vigilante would be viewed as little more then a pawn attempting to thwart some criminal mastermind’s scheme. Sometimes I feel Mort overplays it and the Vigilante ends up relegated to a trivial role in the splash. To a certain extent this is true in “Blunderbuss Booty” splash. However the tooth grins of the three oversized figures give the art an almost surrealistic touch that I find impossible to resist. 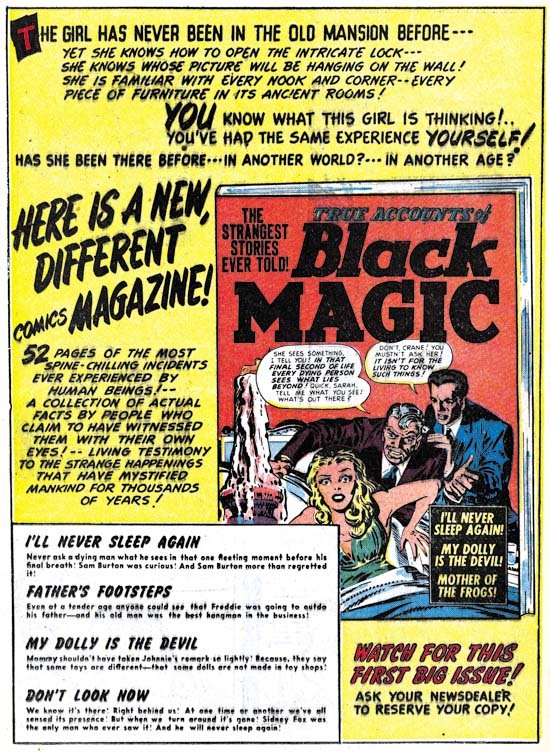 I must admit I so love the Meskin Vigilante splashes that I welcome any opportunity to display examples. I feel they prove my point that Meskin’s art is of such high quality that today the Vigilante should be judged a success. Sadly that is not the case as Mort Meskin is still an overlooked master. He even failed to be voted into the Comic Book Hall of Fame a few years ago. How much worse it would have been when Mort was penciling the feature since there were no comic conventions, Internet blogs or letter columns where fans could voice their appreciation of Meskin’s efforts. So while the splash art has been a pleasant digression to the theme for this post, they still leave us with the question whether there was anything to indicate to Mort Meskin himself that the Vigilante was a successful feature? 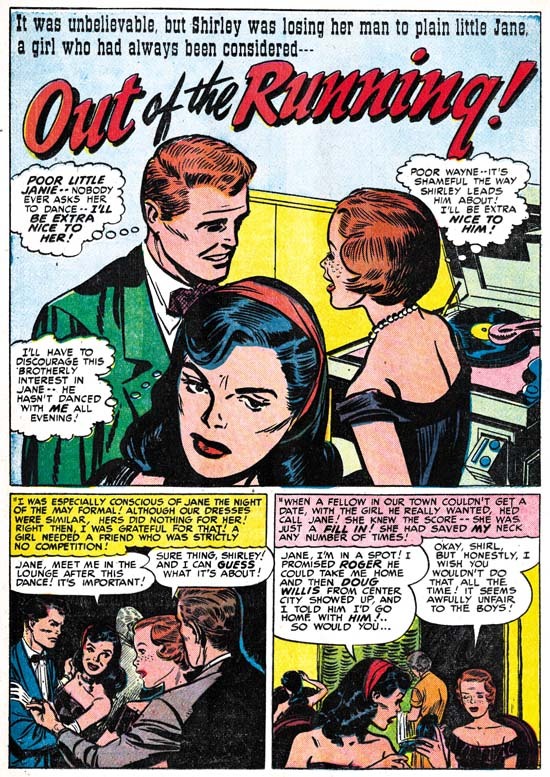 Well there is another way a comic book creation can be shown to be a success, it can be transferred from the comic book page to the silver screen. 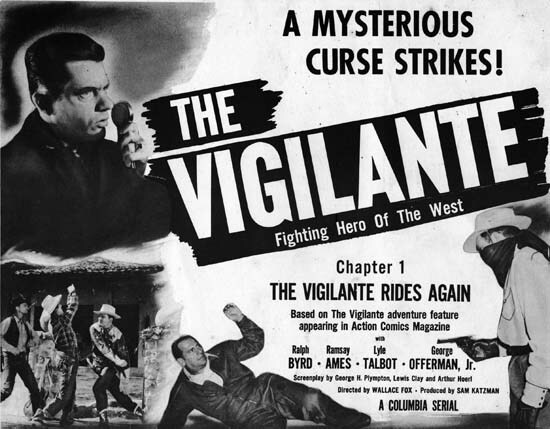 The Vigilante was also serial movie in 1947. 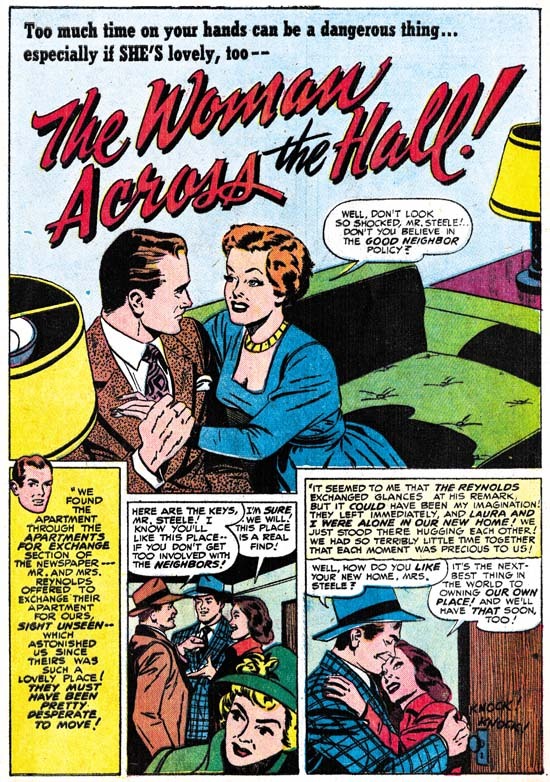 There at the beginning of each chapter on the big screen could be read “appearing in Action Comics Magazine”. Okay we are not talking about Oscar material here. Just a movie serial aimed largely at a younger audience. No great special effects but plenty of action and cliff hangers. The movie version does seem to remain largely faithful to the comic book feature, or as much as you can expect from Hollywood. 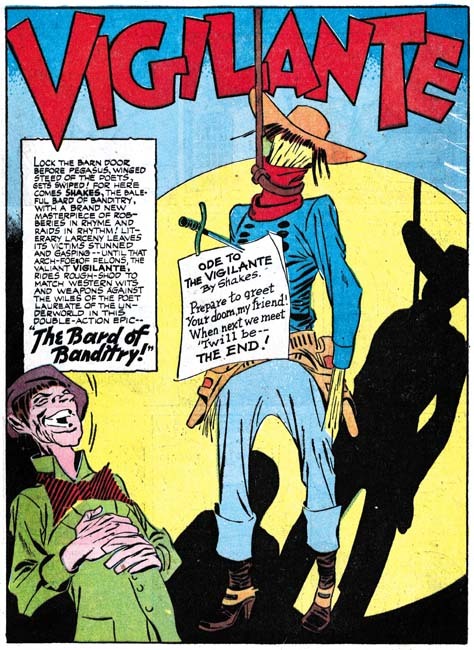 The Vigilante is not only a singer as in the comic book, but he is also a movie star. 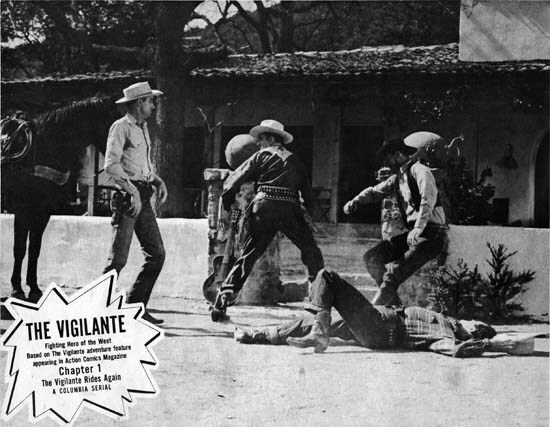 The movie Vigilante also has a side kick named Stuff but he is not a Chinese youngster but an adult man (that is him on the upper left corner of the lobby card shown above). Do not let this above lobby card fool you. 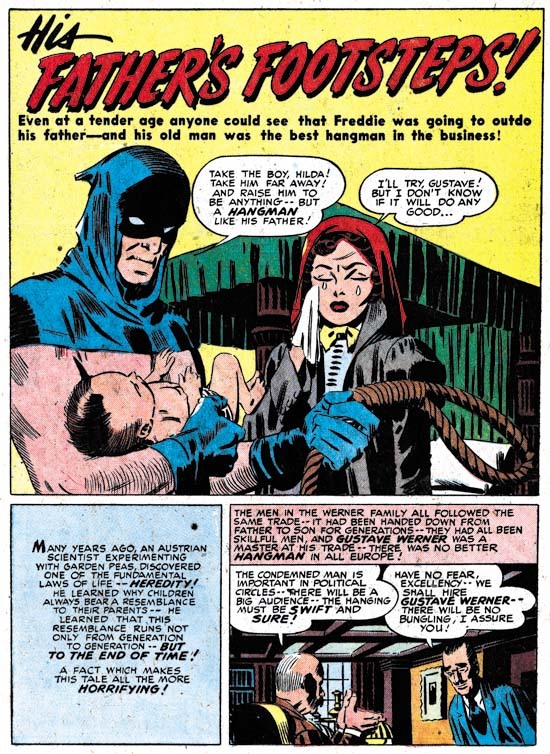 The Vigilante does take place in modern times just like in the comics. The scene is from the opening chapter of the serial and the depicted fight turns out to be a movie being filmed that Greg Sanders, the Vigilante’s alter ego, stars in. However Sanders does seems to fight as often unmasked as he does as the Vigilante. One wonders how Sanders keeps his Vigilante identity secret or why his opponents fear the Vigilante more then they do Sanders. When one minion is captured by the Vigilante but turned over to the police by Sanders why doesn’t that criminal become suspicious? Ah but I forget myself, this is a movie serial and should not be taken too seriously. With that thought firmly in mind The Vigilante can be entertaining although not always for the intended reasons. 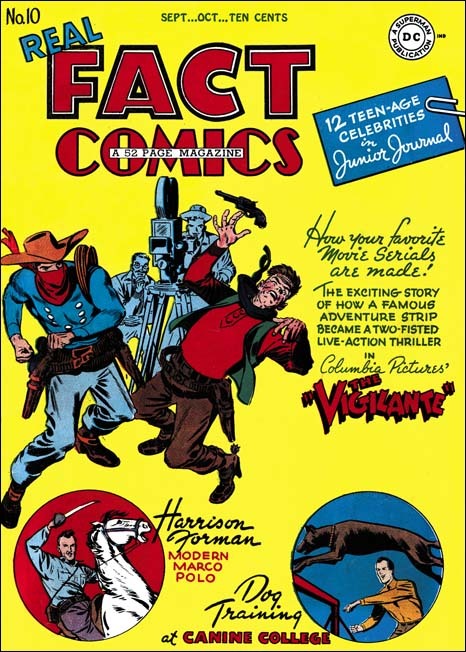 While it is true that the Vigilante never appeared on the cover to Action Comics, he did make it to one cover, Real Fact Comics #10. 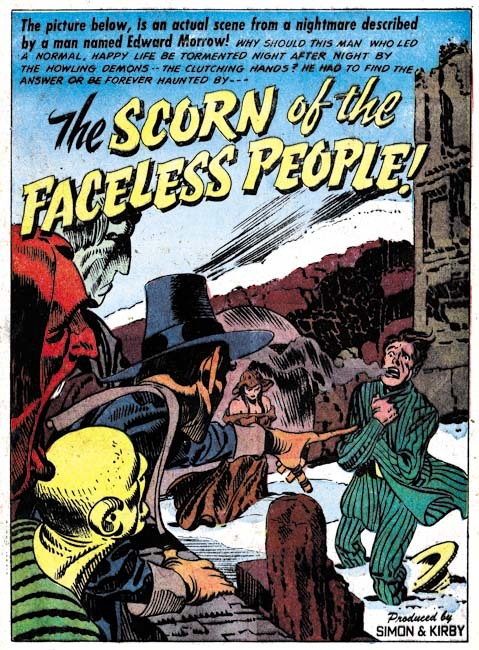 Meskin has his own method of depicting a slugfest; different from Jack Kirby’s but very effective nonetheless. But behind the combating figures we see a movie camera crew. The caption reads “How Your Favorite Movie Serials Are Made”. This cover is not for a Vigilante story but for a feature about the very movie serial that I discussed above. And Mort truly is depicting the movie serial version of the Vigilante. 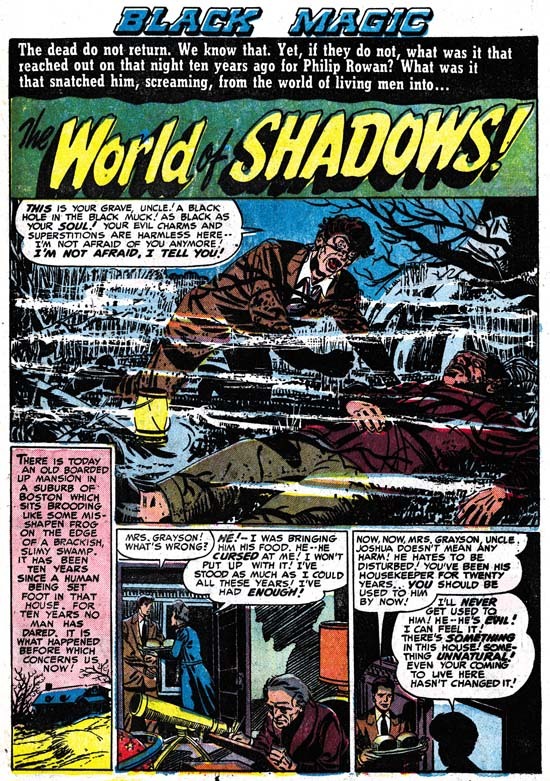 Page five presents a number of dramatic scenes. I can verify that what is depicted in panels 1, 2 and 4 can be found in the movie. I have not finished seeing all the chapters to the serial so I cannot say whether the other panels can also be found but there are Arabs in the movie so panel 5 is quite possible. There is also a panel on page 6 depicting Stuff escaping from a burning barn inside a rolling barrel which can be found in the screen version. 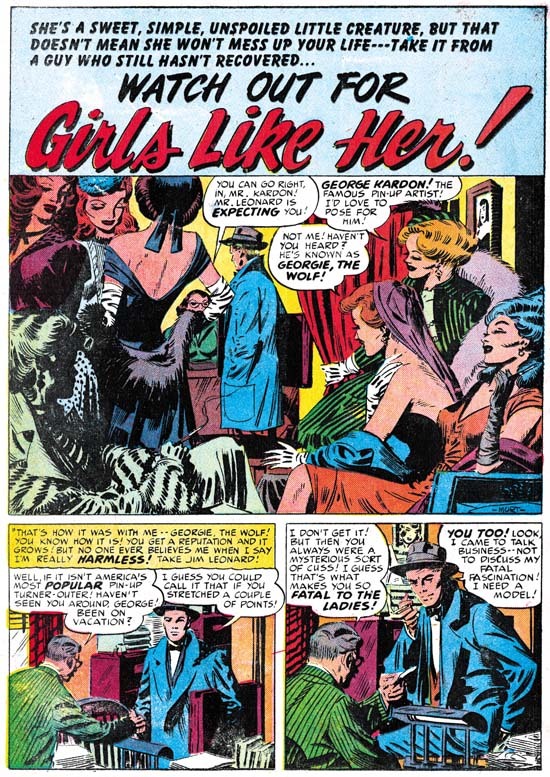 Not that Meskin draws the scenes shown on these pages exactly as found in the movie, his are much better presentations. 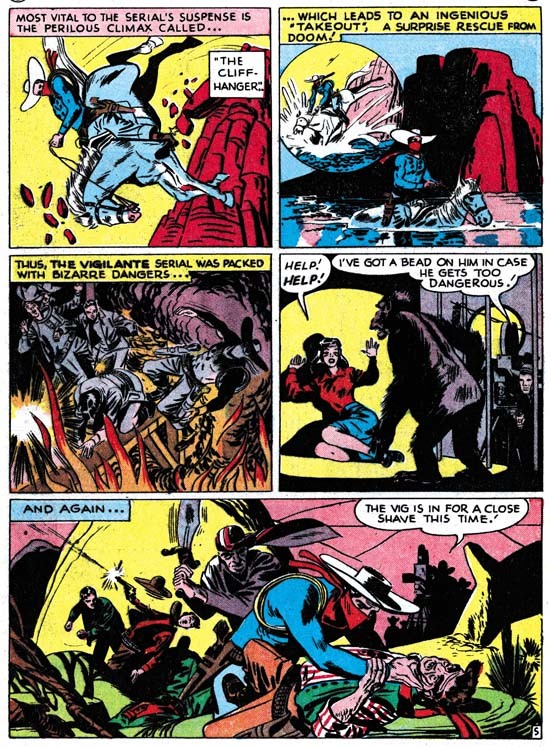 I particularly get a chuckle from panel 4 where there is a man with a rifle prepared to shoot if the ape becomes too dangerous; in the movie he is clearly a man dressed in a gorilla costume. 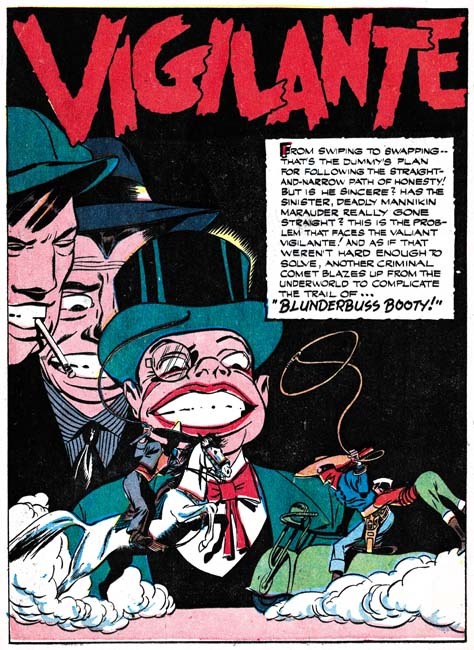 So Mort Meskin was well aware that one of his creations, the Vigilante, had made it to the silver screen. 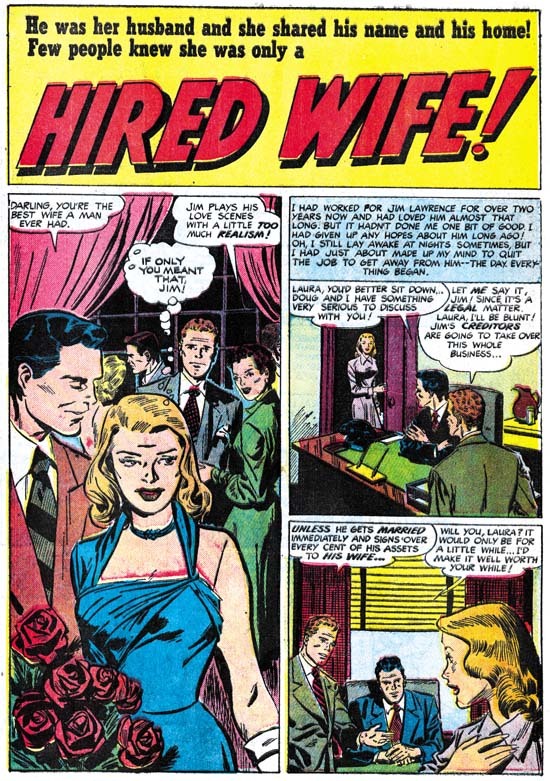 It was a distinction that few of his fellow comic book artists ever achieved. Although we know that Mort realized he had created a very successful feature we do not know how he felt about it. Was he proud of his creation? Or was he bitter that he received no financial reward from the movie, or even a screen credit as the creator of the Vigilante? Sadly we cannot tell. Mort Meskin self evaluation remains an enigma. We must content ourselves with the art he left behind and hope that someday he will receive the recognition that he deserves. 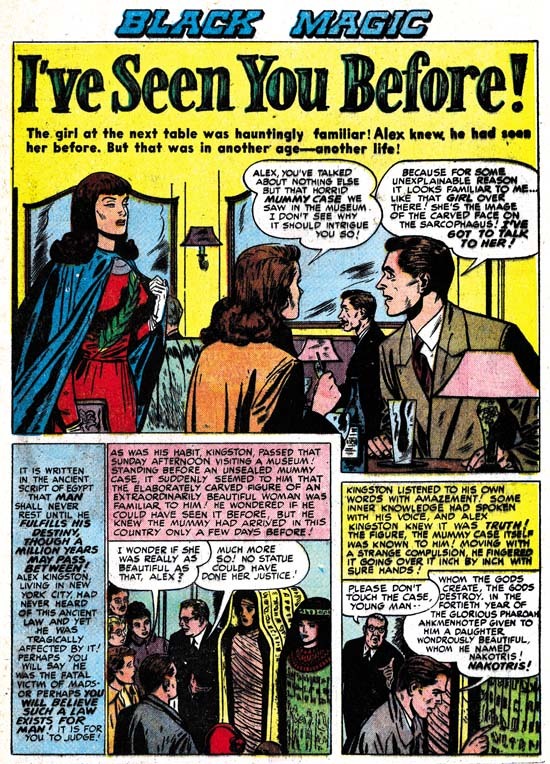 * There is a story floating around the Internet told by Jack Kirby about a conversation he had with Mort Meskin. However that is an obviously apocryphal story that reveals much about Kirby and provides no reliable information about Meskin. It is true; my first post was on March 17, 2006. I have a tool that counts the number of visits and hits (I am not sure what the difference is between the two) and provides information about incoming links. Frankly the statistics are just of mild interest to me since my goals for blogging concern my fascination with Simon and Kirby and not a desire to write a popular blog. Had popularity been my desire I would hardly have selected such a narrow focus for my blogging. I have never paid much mind to the very low number of visits my tool indicated I was getting. Occasionally I would be surprised by some post resulting in a jump in readership. For instance in 2006 I wrote about a cover drawn by John Byrne and inked by Joe Simon. For me it was just a mildly interesting case of an unexpected collaboration, but a Byrne web site linked to it and suddenly my readership sky-rocketed. 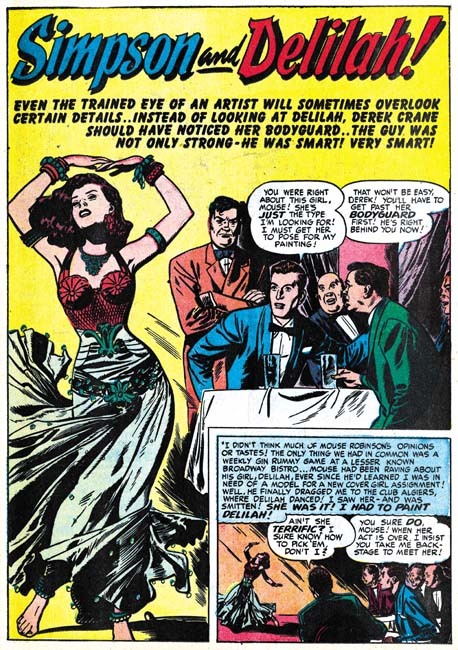 (I always found it amusing that there is so much interested in a modern artist and so little in earlier masters; John Byrne is a talented artist but honestly he is no Jack Kirby.) After a few days following one of these unexpectedly popular posts, the number of hits would drop down and return to the normally low numbers. That is what my first two years were like, but then something strange happened. 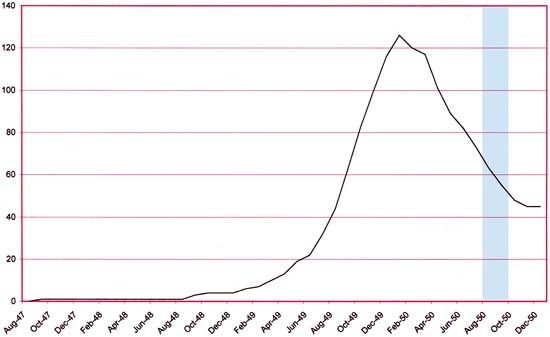 This year after a readership jump the number of visits would not quite return to the previous value. In fact I began to notice increases even without any incoming links to popular posts. Currently my number of visits is almost an order of magnitude greater then last year. Now I know that I have not suddenly become a great writer. Further my posts continue to have the same narrow, historical focus. So if it is not me then I can only conclude that what has changed is a greater public interest in Simon and Kirby. I do not have to look hard to figure out what has caused this shift in public perception, it was Mark Evanier’s book “Kirby, King of Comics”. I believe Evanier’s book has had an impact that greatly surpasses any previous publication about Jack Kirby. 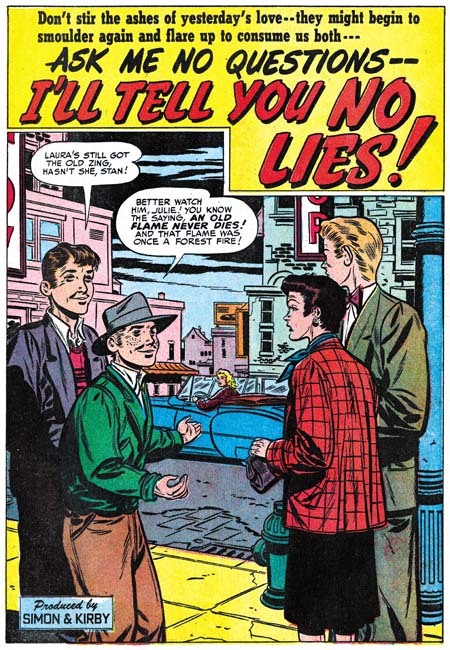 And an increasing interest in Kirby has meant a greater recognition for Joe Simon as well. 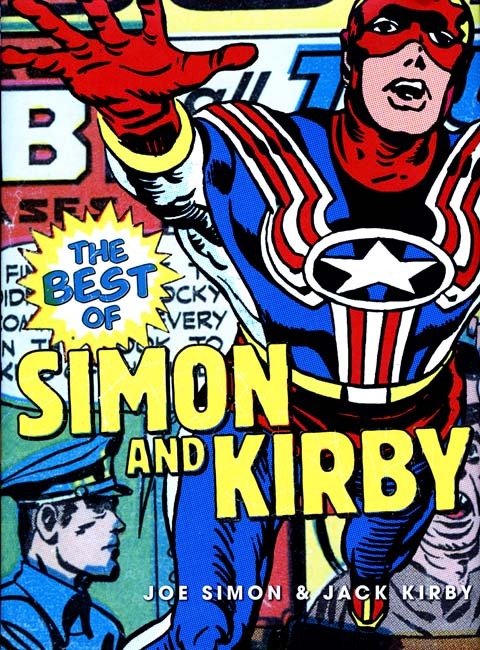 I also want to believe that Titan’s “The Best of Simon and Kirby” (see my previous post below) will further elevate public awareness of Simon and Kirby. 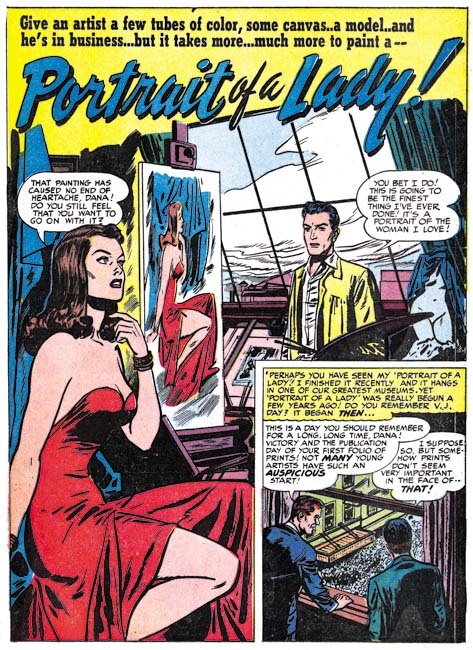 When I started this blog I had not even considered how long I would write about the Simon and Kirby studio. As this blog enters its fourth year I have still only scratched the surface. If nothing else there are many chapters to go in my serial post The Art of Romance. My new serial post, The Little Shop of Horrors, has just started. Although I believe that It’s A Crime has now gone past the time when the Prize crime titles were produced by S&K it still deserves some more chapters. And I do not intend that all my future posts will be limited to those particular serial posts. There are many other fertile grounds to cover. I have a busy schedule and so I have to budget my time. I had set aside a period last Saturday for doing some scans for this week’s blog post. That was the plan. That is until Steve Saffel dropped by that day with an advanced copy of Titan’s book “The Best of Simon and Kirby” (Steve is the book’s editor). Well so much for my original schedule as I spent the rest of the day pouring over my copy of this long awaited book. Good things come to those that wait. Actually this time great things came. I cannot begin to describe how pleased I am with this book. Those readers that have followed my blog closely know that I did the art restorations for this book. So I am hardly unbiased. Still I really believe anyone who likes Simon and Kirby will want this book. This is a large book (12 1/2 by 9 1/4 inches, about the same size of Mark Evanier’s “Kirby: King of Comics”). While I have nothing against the standard archive sized books it is really nice to see Simon and Kirby art larger then life. Jack Kirby was the master of exaggerated perspective. His figures often seem to jump right out of the page. 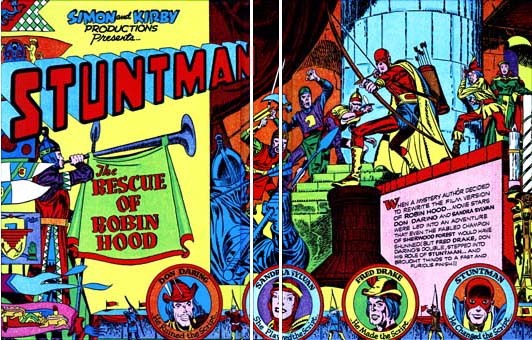 The dust jacket uses a collage of Simon and Kirby art including the Fighting American from the cover to the second issue. All the art are from scans except for the figure of Fighting American which is fully restored. The result is Fighting American really seems to jump off the page even more. That may not seem possible but it’s true. The only thing I have against the dust jacket is that it hides the cover. When you buy this book (notice I assume the reader will buy it) be sure to remove the dust jacket in order to admire the cover. The cover is a Stuntman double page splash and it looks terrific. Joe Simon writes an introductory. Joe’s a great writer and the introduction shows his usual flair for story telling. The book is divided into eight chapters and Mark Evanier provides a short essay for each. What can I say, nobody is more knowledgeable about Jack Kirby then Mark Evanier. I wonder if the time Mark spent as Jack’s assistant had anything to do with what a great writer he is? In any case scholarly knowledge and great writing skills make for some marvelous essays. But let us be honest, all that is window dressing. The real reasons for buying this book are the Simon and Kirby features. There are plenty of those; 192 pages of story art and 5 covers. All, as I said above, larger then the original published size. There are plenty of smaller illustrations accompanying the essays as well. Perhaps the biggest difficulty in publishing a book called “The Best of Simon and Kirby” is picking what to include. 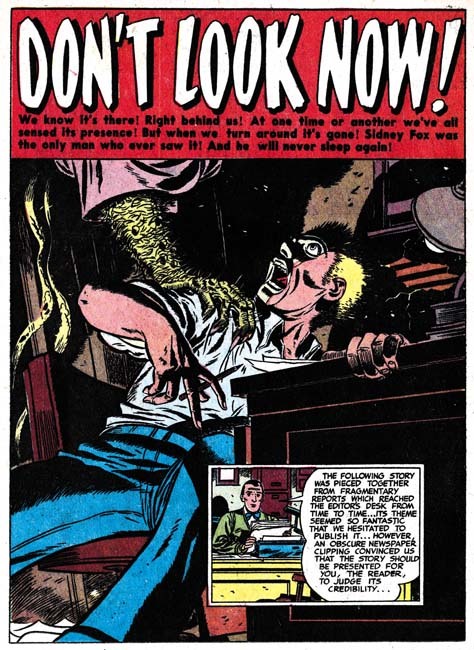 There are so many great Simon and Kirby stories to choose from. I cannot promise that everybody’s favorite will be in this book but I can say that all were selected because of their outstanding quality. 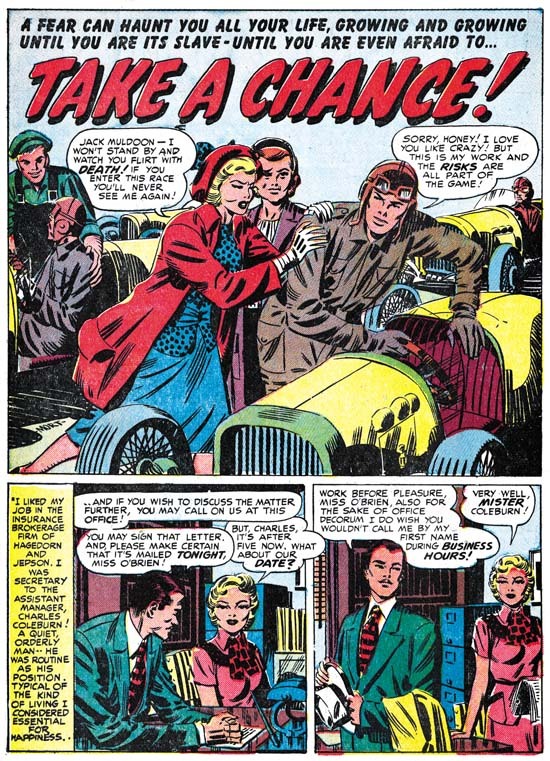 No Simon and Kirby work was excluded from consideration because it was not available for any reason. Even Marvel and DC has agreed to the inclusion of some work that they have ownership rights to. All genres are included with chapters on action heroes, science fiction, war, crime, westerns, horror, humor and romance. 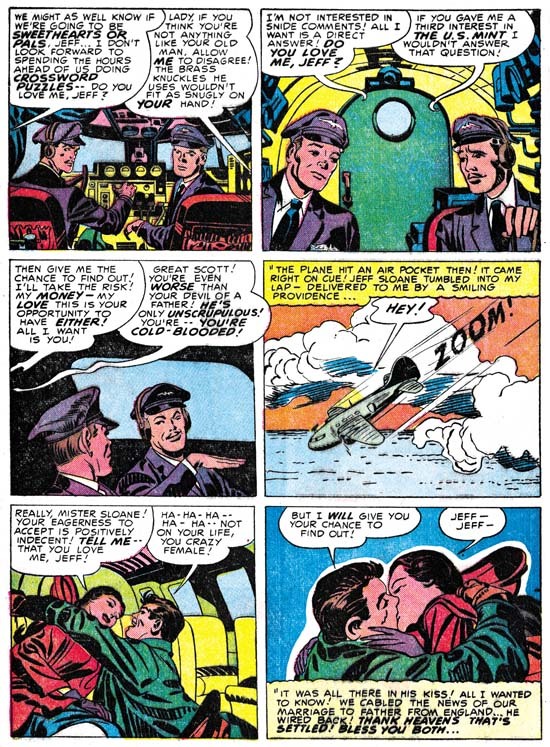 The period covered ranges from one of Joe Simon’s first published stories and goes up to the work Joe and Jack did on the Fly. Most of the art in this book was done by Jack Kirby with all the remaining work done by Joe Simon. The printing has been completed. My copy of this book went by air mail but the rest of the copies are literally on a slow boat from China. The latest issue of Comic Shop News says this book will be out in April. However I have been told that it will get to Amazon in a month and a half and stores in a couple of months which would put it at May. In any case soon to be at a store near you!